The ozone layer protects us from the harmful effects of ultraviolet radiation, notably skin cancer and cataracts. Unfortunately, the largest ozone hole ever recorded in the Arctic has recently unfolded in 2011, reaching about 2 million square kilometers. Since the 1980s, scientists have been recording the size of ozone holes each summer above the Antarctic. The largest Antarctic ozone hole ever recorded was in 2006 which was larger than North America, reaching about 25 million square kilometers. Until 2011, the ozone hole over the Antarctic, which has slowly receded from its size in 2006, has always been larger than its counterpart in the Arctic. The blue and purple colours denote where there is less ozone, whereas the greens, yellows, and reds represent where there is more ozone. The sudden expansion of the ozone hole in the Arctic is due to air pollutants, mainly chlorofluorocarbons (CFCs). These complex chemicals are broken up by sunlight into simpler forms which then react with the ozone (O3) in the stratosphere. Although there has been a worldwide ban on the production of CFCs, they are still being produced and their accumulation is responsible for this sudden catastrophe. Sadly, scientists predict that these harmful chemicals will remain in the atmosphere for about 70 years before they completely disappear. In addition, the polar vortex (a high-altitude wind pattern that circles the Polar region) was unusually strong in 2011 which led to very cold conditions in the stratosphere that lasted for several months. 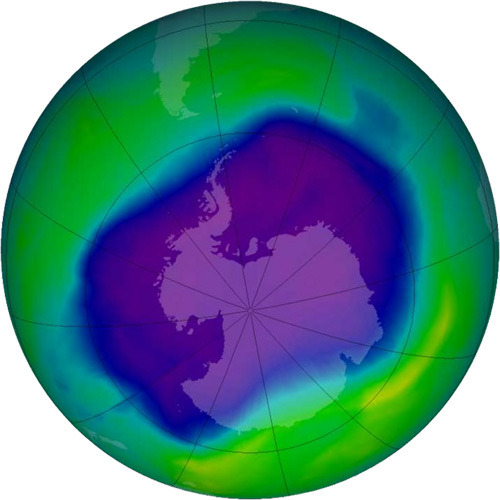 Combined with the CFCs, this led to an increased destruction of the ozone layer over a long period of time. Despite the fact that the ozone hole has been present for so long, this abrupt enlargement of the ozone hole over the Arctic is significant because it now spans over northern Canada, northern Europe, northern Asia and central Russia. In turn, this will cause its inhabitants to be more susceptible to the dangers of ultraviolet radiation. This environmental disaster is but one of many that is happening around the world. Other examples include the oil spills in Niger, the building of a major hydroelectric dam in the Amazon Rainforest, the tar sands of Alberta and the Fukushima Daiichi nuclear disaster which prolongs to this day. Have you heard important news about climate change? Please share it! An aurora is caused by the collision of electrically charged particles with atoms in the thermosphere (see atmosphere), and usually occurs over the Arctic or Antarctic.